Since September 2017, many in America, including our President and Vice President, have been discussing protests in the NFL. And many people on all sides are claiming to speak on behalf of veterans and servicemembers. But we know you can speak for yourself. So wanted to actually hear from you and get your perspective instead of having others speak for you. 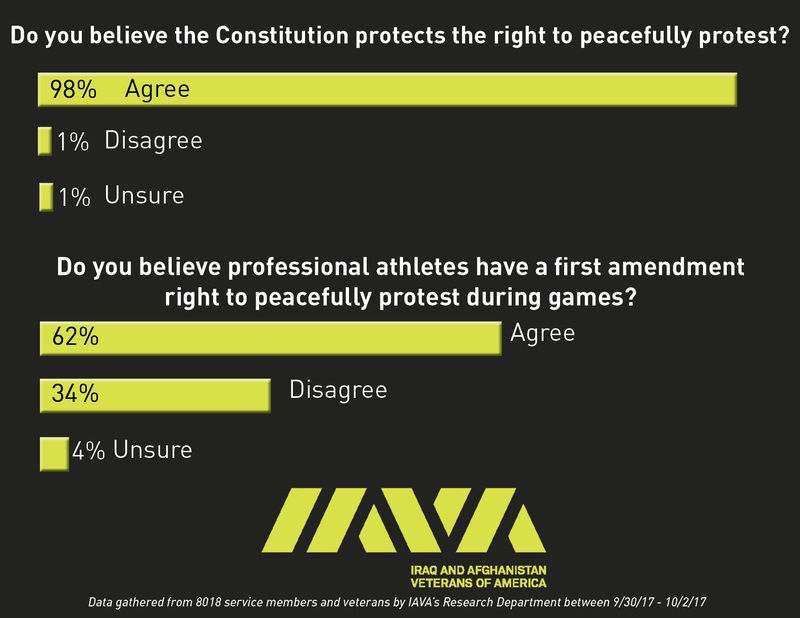 That’s why between September 30, 2017 and October 2, 2017 we polled our members on your opinions on the recent NFL protests. And the results are in: more than 8,000 veterans and servicemembers responded. They have a diversity of opinions on this topic, spanning the spectrum. We also found, unsurprisingly, that you are most interested in issues like hurricane responses, veteran suicide, and national security issues. 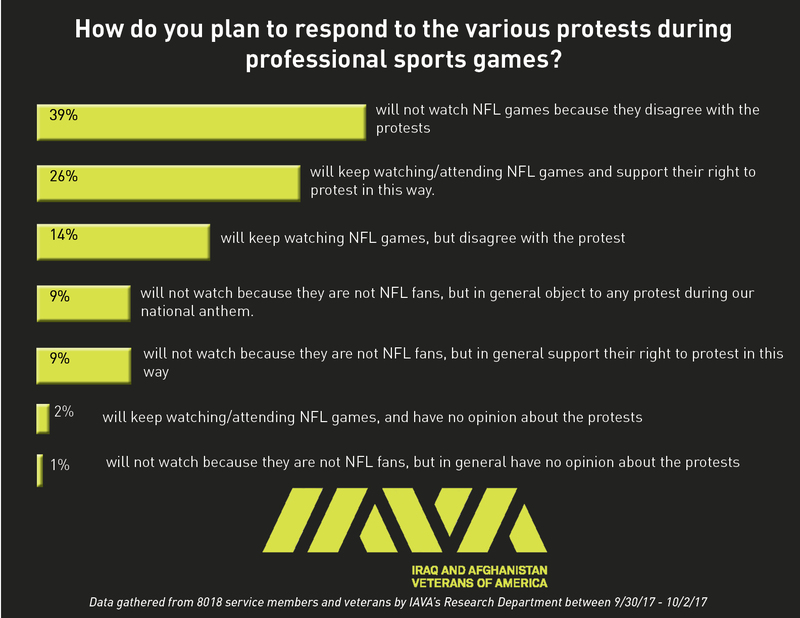 Methodology: Emails were sent to IAVA’s veteran members inviting them to participate in IAVA’s poll on the NFL protests. The poll was available from 9/30-10/2/17. Over 8,000, service members and veterans participated. The margin of error for this poll is +/- 1.1 percentage points at the 95% confidence level. 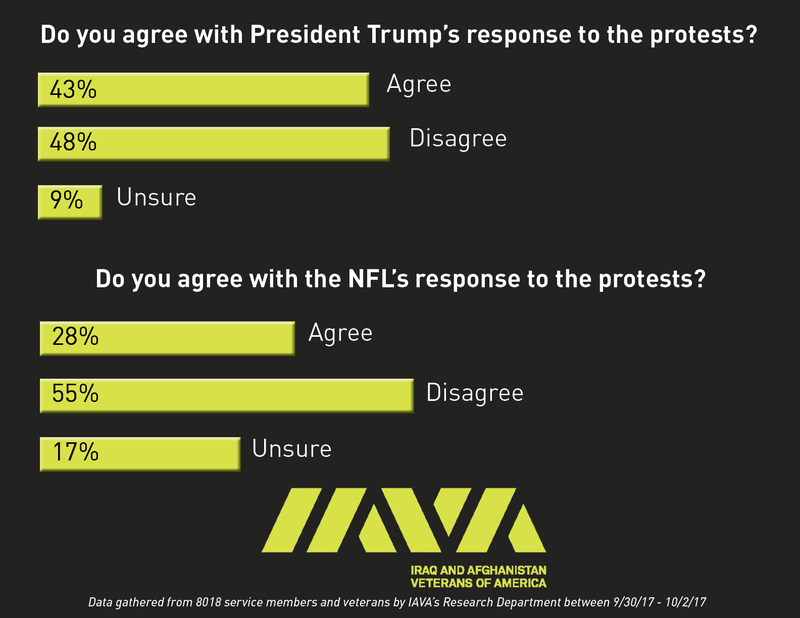 This response is the largest that IAVA has seen in our polling history, and represents only data collected from the military and veteran community. IAVA Research: Led by Dr. Jacqueline Maffucci, PhD, IAVA’s Research Department uses real data to drive the development of scalable solutions to benefit veterans and their families. Through careful analysis of IAVA’s annual Member Survey and continuous surveillance of data about service members, veterans and their families, IAVA’s Research Department informs the development of IAVA advocacy campaigns and programs. 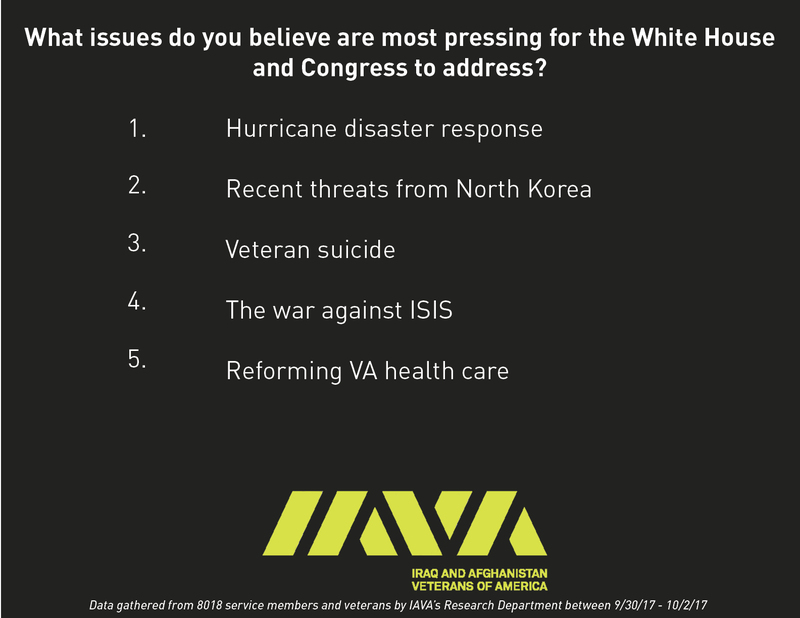 IAVA’s groundbreaking 2017 annual Member Survey will be released later this month; details to come.